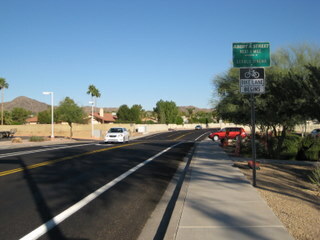 The city of Phoenix has recently installed a bike lane on 51st Street in Phoenix (Ahwatukee), between Warner and Elliot roads [area map]. It is approximately one mile in length. The stretch has appeared (incorrectly) as a bike lane on the MAG Regional Bike Map for years and years. Formerly, an annoying fog line demarcated an approximately two-foot shoulder, causing confusion about where cyclists should ride. The elimination of the fog line, the source of confusion, IS A DEFINITE PLUS. More details and photos here.